There are tons of ways to do centers and by no means am I an expert; however, this is how I do "work center" time in my classroom. I have taken ideas from Debbie Diller, Jessica Meacham, and the KinderKorner website and adapted them to fit what works best in my classroom. I have my centers divided into four categories; Reading, Fine Motor, ABC/Word Work, and Math. Each work group gets one center from each category each day and students choose which ones and in which order they complete them. Here is a picture of my center board. As you can see, I take pictures of each center for the actual board. I also have each basket labeled with a picture, as well as, the area that the basket should be placed within our room. 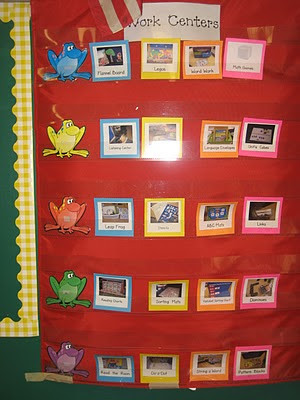 It just helps students locate everything and keep it organized. I have five work groups that change each month. I do not group students according to levels for center time, it is just based on what table they sit at. After the students are comfortable in our classroom I begin teaching centers. It typically takes until Winter Break to teach all the centers. I teach five centers per week. I teach three before lunch and two after lunch and follow it with a practice session on Monday. Tuesday-Friday, I do a quick re-teach of each and follow it with a practice session. I move each center picture down (with the bottom picture moving to the top), each day. The following week, I teach five new centers in the same manner; however, I review the five from the previous week. The most difficult thing about centers, for me, in a Kindergarten room is a toss up between volume control and simply put...how needy some students are. Here we are in January, I've spent months teaching and re-teaching so I can work with small groups for Reading instruction, but there are days that "Kenny" cannot find the Stamp-the-Alphabet bin and he will not ask a friend, he insists on saying my name...no, yelling my name, over and over and over. I have to stop my reading group instruction because "Kenny" is screaming and has nearly lost it. You just can't seem to prevent the noise and needy factor. I just have to accept that this is how it is suppose to look in Kindergarten. People have asked me why I don't just group the centers like Debbie Diller because taking individual pictures is far more time consuming and in taking individual pictures, I limit what students are doing. I found over the years that I like to make sure that certain activities are at least attempted by my students. When I grouped all the ABC Work together and allowed students to choose any activity, some of them chose the same activities every time and never tried new or more challenging activities. Here are some of the documents I use in conjunction with our centers. I create dice using 1" color cubes from Lakeshore Learning- http://www.lakeshorelearning.com/seo/ca%7CsearchResults~~p%7CRA838~~.jsp. I separate each set into gallon size bags. I LOVE this game! I create 3 dice, two blue with common consonants (I usually choose s, t, p, n, m, c, d) and one red with the vowels. Students roll all dice and arrange them blue, red, blue. They have to blend the sounds into a word and then decide whether it is an Earth word or Alien word. I will admit it...I have been a junkie for building up my Listening Center. I built it through my Scholastic Book Orders over the course of a year and a half. I love having sheets that go along with the center, to give students practice copying text and comprehension. I like to change up the stamping center by having students stamp the alphabet and words. The sheets are pretty self explanatory. WOW Shannon! Your site is amazing. We were just talking the other day (in K-Town, as we like to call it) about how we end up doing the same centers year after year and are just sick of it. I just forwarded your link to my entire team!! :) Do you make all of these things yourself or do you find some other places? Either way...THANK YOU for sharing! The listening center printable is giving me the same trouble! Is it me?? It doesn't have the DL option at the bottom like all of the others?? Wow! Thank you so much for sharing! I always struggle at implementing my centers WELL! I have 23 this year with no aid and it will be FUN! One of my goals is to be successful with centers this year. I always end up lacking with the literacy stations and end up just doing mostly play centers.. I hope I can be strong and make it work this year. Thank you so much for the ideas! Just found your blog! Love it! Thanks so much for sharing! I love your Earth Words/ Alien Words center. I am going to use your idea, but change it to Earth Words / Dr. Seuss words, as that is what we can nonsense words in my classroom. You are an inspiration to others! Thanks again! Thanks so much for sharing - your ideas are fabulous! Thank you for sharing all of your fabulous ideas! I LOVE your blog! I love your blog! Thanks for all of the great ideas! Thank you so much for sharing all your wonderful work and ideas....so time consuming for you and so helpful for me! Thanks so much for posting all of the literacy center activities!! I love them! (How do you have time to create all this and teach?!) I'm in awe! Thank you for sharing all your wonderful ideas! It has been eleven years since I've taught kindergarten and I was incredibly excited but so nervous and unprepared. I am so grateful for everyone who blogs and shares their wonderful ideas. Thanks for some great ideas. This is my third year teaching Kindergarten and I'm constantly trying to get better at it. I love these ideas!! Thank you for sharing all the activities you do for literacy centers! I will be starting the Daily 5 in my Kindergarten classroom in January. I am working on getting all of my centers set up now and you have given me some great ideas! Your blog is wonderful!! I am so happy to have found you this Sunday evening when I am trying to find inspiration to face my little darlings Monday morning. :) Your ideas are amazing. Thank you!! Hi Shannon! For you listening centers, I love the different pages. Do you have students listen to the same story for four days and have them do a different page each day? Or do you just use different pages when you want to focus on different skills? I love your ideas! I have seen your center layout form with all the word work centers and I would love to hear more about them! Wow! I got lost checking out all the downloadables on this post! I absolutely love your ideas for kindergarten. I created a link to it from my blog Lil Book Chompers...I hope you can check it out http://lilbookchompers.com/. I'm just starting out in the teacher-blogging world and attempting to get involved in the blog community! Congrats on your new bundle of joy :) I'm due in March!! Love you're ideas!! I'm student teaching right now and I have been able to use a lot of your ideas!! Thanks so much!! I am bookmarking, printing, and pinning this post! Thank you for sharing your center ideas. I have a small class--the limit is fifteen--and we seem to move through centers at lightning speed! Over the summer, I want to create a more detailed, methodical plan for my station rotations. your blog has always been helpful and informative! Have a great weekend! Thank you so much! I'm looking forward to using these in the next school year. Great stuff! I have just began looking through your blog...I love it all! Thank you for the fantastic ideas! I LOVE your stuff! What GREAT ideas!! Any new ones to share?? How exactly do you do your Alphabet Toss game?? Wow, thank you for providing so much help to us new teachers, with all the GENIUS ideas and free downloadables :) I am sure even veteran teachers can benefit from your blog!